Despite some notable flaws, the Nissan Armada is amongst one of the best large SUVs on the market. Large, family-oriented SUVs based on pick-up truck platforms shouldn’t necessarily work in theory, but the reality is a lot of them are legitimately very good all-rounders. For sure, areas like fuel economy and refinement levels aren’t where they traditionally excel at, but they more than make up in a majority of cases by being spacious, comfortable and rugged enough to tackle whatever the US road network can throw at them. Which is where we can nicely introduce the Nissan Armada. 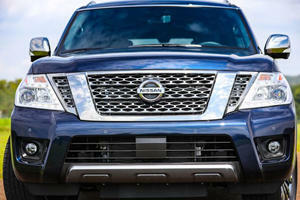 As alluded to earlier, it isn’t a perfect vehicle, and there are some areas where the SUV lags behind its rivals a tad, but the Nissan Armada nevertheless is a mighty fine vehicle that’s also coincidentally one of the top cars in its class. The Nissan Armada isn’t that spacious – even by seven-seater SUV standards. Considering the Nissan Armada is 5.3 meters long, it may be unusual to see us criticising the car in terms of the space it has on offer. After all, how can a vehicle that’s almost as long as some luxury limos be lacking in the interior volume stakes? Alas, the Nissan Armada isn’t that spacious – even by seven-seater SUV standards. The third row of seats in particular is quite cramped, with the limited amount of leg room being our biggest bugbear, especially when rivals that are slightly shorter (such as the Toyota Sequoia and Ford Expedition) aren’t affected by this as much. Likewise, the trunk isn’t particularly spacious by the standards of this class with all the seats in place. Admittedly, the Nissan Armada isn’t the worst offender in this category (the Chevrolet Tahoe, for instance, only has 15.1 cubic feet of space behind the third row of seats), the 16.5 cubic feet capacity of the Armada isn’t particularly ground-breaking, with vehicles. Regardless of whether you go with a seven-seater or eight-seater configuration, the only way you’re going to bring everyone’s luggage along is to make use of the Nissan Armada’s 8,500 lbs towing capacity and lug around a trailer with you. The Nissan Armada should comfortably swallow up larger amounts of luggage with relative ease. Handily, the Nissan Armada isn’t as compromised in the rest of the core areas. The front two rows of seats, for instance, provide much more head and leg room than the rear row, to the point where taller passengers should be able to sit comfortably in the car. Storage cubbies are also decently sized, and the trunk’s a far more usable 49.9 cubic feet with the rearmost row of seats folded away – not only is the load bay completely flat, but the lack of a trunk lip and the boxy shape of the cargo area means the Nissan Armada should comfortably swallow up larger amounts of luggage with relative ease. Our only criticism, in fact, is that the optional power-operated third row of seats takes an absolute age to fold away completely flat. Admittedly, it’s not a massive issue, but there’s no denying the lethargic rear seat folding mechanism does have to the potential to be a frustrating inconvenience over time. We’re also not massive fans of the infotainment system, which feels rather dated and out-of-place in a vehicle with a nigh-on $45,000 sticker price. For sure, the system is fairly responsive and intuitive enough, but we do feel it lets down the high-end feel of the rest of the interior. That’s not to say the Nissan Armada isn’t able to plug through the rough stuff. Traditionally, truck-based SUVs tend to be noticeably better suited to life off-road than on-road, due mostly in part to the beefy hardware that underpin them. However, the Nissan Armada isn’t cut from the same cloth as most other vehicles in this class, as it’s not immediately well suited to tackling tougher terrain as, say, a Toyota Sequoia. That’s not to say the Nissan Armada isn’t able to plug through the rough stuff. With a high ground clearance, plenty of suspension travel, lots of articulation, an optional all-wheel drive setup and ample grunt from the engine we’ll discuss in more detail later on, the Nissan Armada can deal with off-road routes. 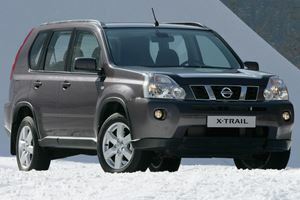 However, as the vehicle is devoid of the systems you’d normally see in dedicated off-roaders (most notably a locking differential, which is most often used in vehicles of this type to improve traction over slipperier surfaces), we wouldn’t necessarily recommend it over other rivals if you seriously need the cross-terrain ability. Where the Nissan Armada does surprise, though, is its ability to suppress most of the aspects that can make driving on the open road a real grind. The long suspension travel we mentioned earlier, for instance, results in a compliant and comfortable ride on the asphalt, and noise insulation is remarkably well suppressed for a vehicle of this type. For sure, there are some compromises as a result of the Nissan Armada’s boxier proportions (the chunky wing mirrors result in a fair amount of wind whistle, for instance), but there’s very little to find fault with refinement-wise. The only area where the Nissan Armada falls short on when driving on asphalt, in fact, is in terms of rearward visibility. Even more amazingly, the Nissan Armada’s quite straightforward when it comes to threading the SUV down the road. For sure, being a large vehicle, the Armada was never going to be pin-sharp precise to drive, but the combination of responsive steering and a broad view out through the windshield means you can place the Nissan where you want it with relative confidence. Even body lean in the bends is surprisingly limited for such a tall and softly sprung machine. The only area where the Nissan Armada falls short on when driving on asphalt, in fact, is in terms of rearward visibility. Much like the Infiniti QX80 it shares a lot of technology and features with, the Nissan Armada has some very chunky rear pillars, which do generate some sizeable blind spots when looking out of the back. Thankfully, the rear window is of a decent size, and the standard-fit parking sensors and reversing camera do go some way to rectifying the chunky pillar issue (a blind spot monitoring system is also available as standard on top-spec ‘Platinum’ Nissan Armadas, and as an optional extra on mid-tier ‘SL’ spec cars). 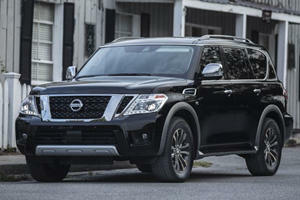 The Nissan Armada is only available with one engine option: a whopping 5.6-liter eight-cylinder gasoline unit. Diesel and turbocharged gasoline engines may be increasing in popularity in SUVs nowadays, but there’s still a place for the more traditional, larger gasoline engines that used to dominate this sector. At least, that’s the reasoning we assume Nissan’s product development chiefs had, as the Nissan Armada is only available with one engine option: a whopping 5.6-liter eight-cylinder gasoline unit. Being such a large engine in an equally vast car, the 5.6-liter isn’t exactly renowned for its on-paper economy figures. Even by the standards of comparable engines in this segment, the claimed economy figures of 14mpg in the city and 19mpg on the highway aren’t especially impressive (a like-for-like Chevrolet Suburban, for instance, will return 16mpg in the city and 23mpg on the highway). Worse still, those figures are for the most efficient, rear-wheel drive version of the Nissan Armada – add the optional all-wheel drive system, and those economy figures each drop by one mpg. It’s no rocket ship, but the Nissan Armada is handily endowed with enough punch for the car to pull strongly from standstills and on overtaking runs on the highway. Thankfully, the rest of the powertrain is much more up to par. With 390-hp and 394 lb-ft of torque to play with, the Nissan Armada has enough grunt to drag this huge and heavy SUV up to speed fairly promptly by class standards. It’s no rocket ship, but the Nissan Armada is handily endowed with enough punch for the car to pull strongly from standstills and on overtaking runs on the highway. 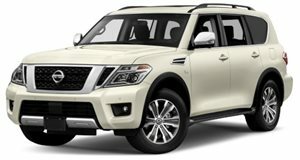 Having a smooth-shifting seven-speed automatic transmission also helps the Nissan Armada on the pace front, with the slick gear shifts and the abundance of ratios to choose from meaning the 5.6-liter engine should stay in its optimum rev range when cruising about and during acceleration runs. Plus, the transmission does a decent job of selecting the most appropriate gear for the conditions, meaning you shouldn’t need to wait for an unnecessarily long time for the transmission to decide which gear is best for the current situation. By the standards of the large SUV class, the Nissan Armada is reasonably well priced. By the standards of the large SUV class, the Nissan Armada is reasonably well priced. For sure, even the base model will set you back at least $44,900, but the Nissan Armada is admittedly aimed at a fairly wealthy target audience, and it’s worth pointing out that some rivals, like the GMC Yukon ($48,315) and Chevrolet Tahoe ($47,215) are pricier, are noticeably more expensive to buy. That relative value proposition is further amplified by the fairly generous amount of equipment that comes as standard on the base spec Nissan Armada. Dual-zone climate control, a reversing camera, built-in navigation, power-adjustable front seats front and rear parking sensors all come fitted to the entry-level Nissan Armada – which is quite impressive, considering many similarly-priced mid-sized executive sedans can only come with such gear if you pay extra for them as optional extras. It’s the mid-range ‘SL’ trim that we feel is the real sweet spot in the Nissan Armada range. For sure, it’s not cheap at $49,650, but the extra items that come installed – such as heated front seats, a power-operated tailgate, all-round leather upholstery and an array of cameras that make the Nissan Armada easier to park in tighter spaces – are worth the premium in our eyes. As the Nissan Armada is a very new addition to the luxury SUV market, it’s impossible to say how reliable the vehicle will be. Plus, the ‘SL’ trim also has access to the Technology Package, which introduces adaptive cruise control, emergency autonomous braking, blind spot monitoring and a rear collision prevention system to the already very nice equipment levels. At $1,770, it is expensive, and it’s a shame that Nissan forces you to spend $800 on the powered sunroof in order to have access to the Technology Package, but we feel the outlay is worth it when the end result is all the Nissan Armada you’ll likely ever need. As the Nissan Armada is a very new addition to the luxury SUV market, it’s impossible to say how reliable the vehicle will be. That said, the signs are initially reassuring: most of the technology underpinning the Armada has been used in various other Nissan models, and the decent three-years/36,000-miles bumper-to-bumper and five-years/60,000-miles powertrain warranties are fairly decent by class standards. Likewise, though no crash test results have been published yet, the Nissan Armada’s broad array of airbags and safety features should ensure the occupants will remain well protected should the worst happen. Russia Actually Issued An Automotive Safety Recall?! New top-of-the-line trim unveiled in Texas. New intelligent mirror provides rear view visibility even with a car loaded with balloons. Наш нужный портал с информацией про витрина для рыбы.